Romney newspaper endorsements: Backing the GOP candidate because he would appease Republican extremists. Because Mitch McConnell and John Boehner brought governance to a halt, we should give them Mitt Romney as their chosen negotiating partner? It is one of the first rules of parenting. During the financial cataclysm of 2008 we said it differently. When we bailed out banks that had created their own misfortune, we called it a “moral hazard,” because the bailout absolved the bank’s bad acts and created an incentive for it to make the same bad loans again. We are now seeing the presidential campaign version of the moral hazard from editorial boards and columnists. They would reward the bad behavior and nihilistic tactics that created the political stalemate between the White House and Congress that has caused the public’s loss of respect for our political structure. Read some of the editorials and columns endorsing Romney. 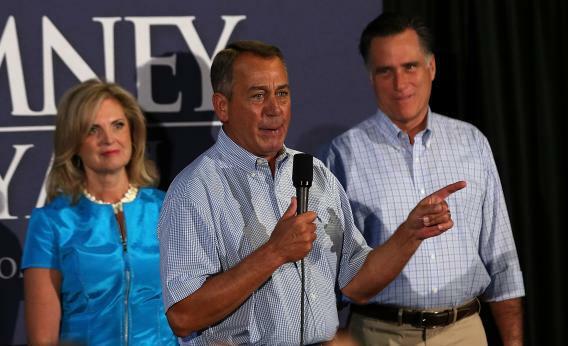 The common thread is that Romney will be able to work with the Republican Congress. Because he is willing to shift his views, he would engage in the sort of negotiations that could produce deals. Let me reinterpret this: The Republican leaders, who held the nation hostage on everything from the debt ceiling to meaningful jobs bills are to rewarded, and the politician, Mitt Romney, who by his own campaign’s admissions has been devoid of constancy on major ethical and fiscal issues, is applauded for lacking principle. Because Mitch McConnell and John Boehner brought governance to a halt, we should give them Mitt Romney as their chosen negotiating partner? Such is the logic of these amazingly cynical and disappointing endorsements. To read the Des Moines Register endorsement of Romney is to read a logic that would have justified Neville Chamberlain’s appeasement of the Nazis: Cave to the entity that refuses to negotiate, and then blame the party that does stand on proper principle yet still tried in good faith to negotiate a deal for the public good. Such skewed logic is horrific to read. Credit Ezra Klein and some others for shining the light on this. And shame on those who are rewarding the worst form of politics we have seen in many decades.